Distribution: Upper Blue Mountains, New South Wales; restricted to sandstone cliffs in the spray zone of waterfalls. fitzgeraldii... After Robert D. Fitzgerald, a 19th century botanical artist. Conservation Status: Listed as Endangered under the EPBC Act* (ie. facing a very high risk of extinction in the wild in the near future, as determined in accordance with prescribed criteria). Classified as 2ECi under the ROTAP * system. Pherosphaera is a genus of 2 species, both restricted to Australia (the other is P.hookeriana from Tasmania). 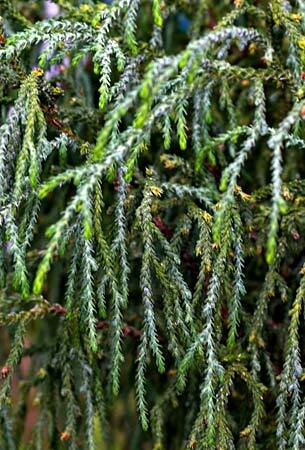 They are small to medium shrubs with short, stem-clasping leaves. These plants were originally classified under the name "Pherosphaera" but were subsequently placed in the genus Microstrobos and are still commonly found under that name in many publications. The original name has been recently restored. Pherosphaera fitzgeraldii (syn. Microstrobos fitzgeraldii) is a small shrub up to 1 metre high and up to 2 metres wide, although rarely if ever seen this large in cultivation. The small leaves are greyish green in colour (whitish on the upper surface) and up to 3.5 mm long. They are narrowly lanceolate in shape. The male and female cones are found on different plants - male cones are about 6 mm long and female cones are about 3 mm long. 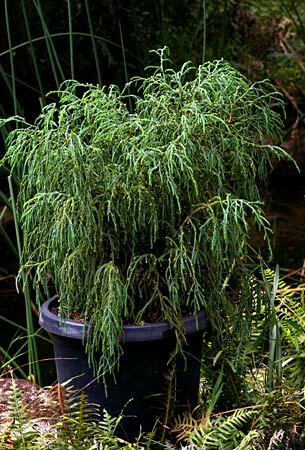 Although not widely cultivated, this plant makes an excellent, weeping specimen for a container. It requires moist soils and potting mixes but these must be freely draining and must not become waterlogged. It grows best in a shaded or semi-shaded location and will tolerate severe frosts. Propagation can be carried out from seed which germinates well, without treatment. However, seed is rarely, if ever available and the preferred propagation method is by cuttings of firm, current seasons growth. Cuttings generally strike reliably.